An ounce of prevention…What you can do now. MarieClaire asks “Why is the Internet still an unsafe place for opinionated women?” The Mozilla Foundation Internet Health Report looks at digital inclusion, privacy and openness and what can be done. The Center for Media Engagement at the University of Texas-Austin surveyed 75 women journalists about their experiences with online abuse. They confirm what we know…daily nastiness on the web is part of the job. Mosaic offers this interesting read (which was also picked up by CNN, Daily Mail and others) on how social media “amplifies the personal rewards of expressing outrage” and can make ordinary people mean. Professors (and their families) are growing targets on online abuse, NPR reports. At an Internews roundtable, Kenyan journalists said they were struggling both with overt threats and attacks where their own lives were in danger, and also with coping with the trauma that comes when “bearing witness to human suffering.” They said their media outlets had done little to assist with the impact of such traumatic experiences on their mental health. The International Association of Women in Radio and Television summarizes two weeks of panels and workshops on online harassment at the Commission on the Status of Women in New York this March. Listen to this 3-minute segment on TrollBusters and the #MeToo movement and why Dr. Michelle Ferrier, founder of TrollBusters, feels there’s a privilege to being able to speak out and there are many silenced stories that the #MeToo movement has left behind. Share Your Social Media Policy With Us! We believe that when media organizations require reporters to use their personal handles to promote their journalistic work, they also bear some responsibility for helping their reporters cope with or protect themselves against online harassment. We’re collecting social media policies from media outlets, and we’d love it if you would send us yours. We’re particularly interested in what personal information reporters must make public, how they are coached to respond to online harassment, and what resources, if any, are in place to assist. You can send policies to report@troll-busters.com. Concerned about online harassment of journalists in your newsroom? 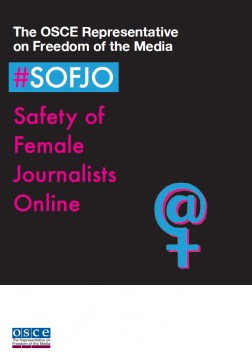 The Organization for Security and Cooperation in Europe (OSCE)’s Representative on Freedom of the Media, with the help of TrollBusters, compiled a report on online abuse of female journalists. It offers concrete steps management can take to protect its reporters. Read our recap of the report’s recommendations. This week, check out these great resources on the web. Written by longtime war correspondent Abeer Saady, the International Association of Women in Radio & Television’s “What If?…Safety Handbook for Women Journalists,” is a must-read. It includes a chapter on digital safety. Learn more about IAWRT’s safety guide. Troll-Busters.com hosted a 2-½ hour session to create strategies for supporting women journalists online at Internet Freedom Forum. Attendees produced a gap analysis matrix of online threats and journalists and the organizations fighting to protect them.